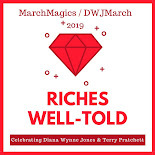 What originally gave me the idea to focus on children's poetry this month was an email from a Candlewick Press publicist asking if I would like to review any of their current poetry books. Z happens to have an interest in poetry so I accepted two books that I thought would be a good fit for us. 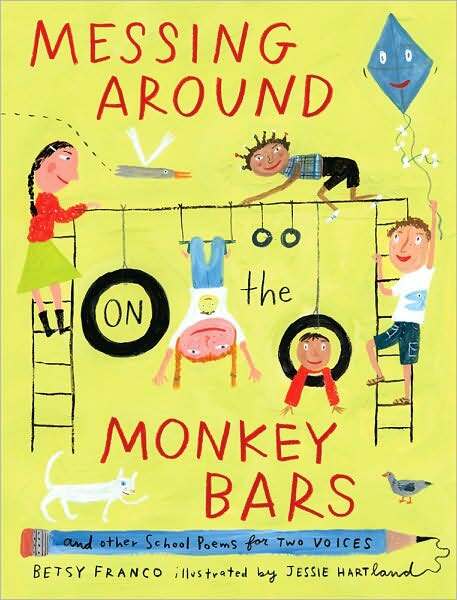 The first is Messing Around on the Monkey Bars by Betsy Franco and illustrated by Jessie Hartland. This is a book of poems about school that are read in two voices. The text is different levels of bold for each reader. There are poems about lunch, recess, the school bus, homework and much more. This is a book that requires the participants to be readers rather than just listeners. The subject matter in some of these turned out to be just a bit old for Z. Since he's only in half-day Kindergarten, he doesn't ride the bus or have lunch. He also doesn't have some of the subjects mentioned in the poems. Still, he liked the interactiveness of the poems and there were a few that worked for him -- like New Kid at School, In the Library, and Me and Joe Lining Up After Recess -- a fun one about two kids who are chatty and fidgety in line! This book should do really well with most grade school kids. The back of the book also has alternate ideas for reading the poems with larger groups of kids -- something that made me want to bring this book to the attention of our school librarian! 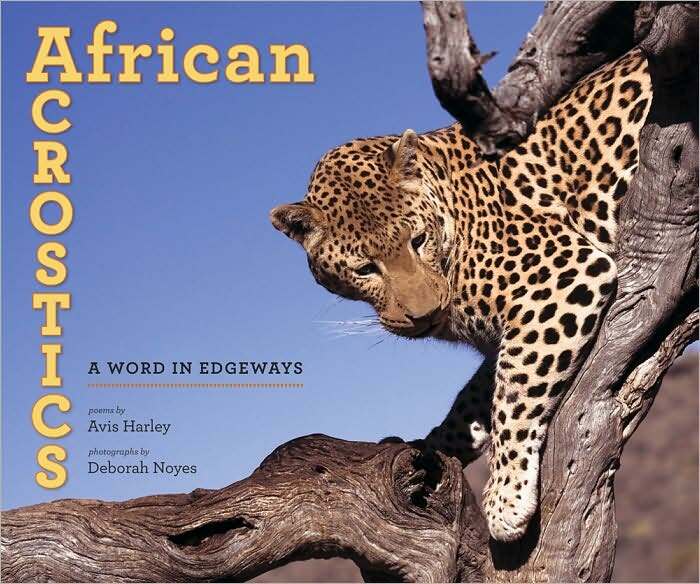 The second book we received is African Acrostics with poems by Avis Harley and photographs by Deborah Noyes. (And if you recognize the name ... yes, it's that Deborah Noyes. Strangely, I will be reading her novel Captivity in the next month or two). If you aren't sure what an acrostic is, the book starts with a great poem about acrostics! Enjoy and would like to define. And fill in each line. Your name is a very good way to begin. Surprise yourself. Find that poem within! Z absolutely loved this book. He loves puzzles and word play and these acrostics with their hidden messages got him very excited. He's also always loved African animals and this book has fantastic photographs and animal facts. A couple of the poems are a bit awkward due to the forced nature of an acrostic. Most of them, though, are quite witty and fun. Z kept looking at this book through the rest of the afternoon after we read it together. I think one thing that turns some children off to poetry are the traditional style books with dull watercolors and pencil sketches and I think both of these books do a great job of bringing poetry to modern children. The books are visually appealing and the subject matter is something easily understandable by most kids. 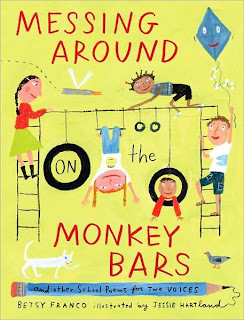 Support our site and buy Messing Around on the Monkey Bars: and Other School Poems for Two Voices and African Acrostics: A Word in Edgeways on Amazon or find them at your local library. We received our copies from the publisher. How nice they sound! I love poetry, but sadly, I do not really have time to read poems at the moment! I happened upon your site as I was looking for interesting books to read with my kids and your website name made me laugh. I read all sorts of book with my kids. We'll have to look for this poetry book a the library next time we're there as I think they would like it. My kids love comic books because of the great grapic pictures. They are very excited about a new Disney comic book called Disney Fairies: Prilla’s Talent. It's evidently the first in a series about the fairies in Pixie Hollow and is coming out April 13th. I'm happy they are excited about books! Thanks for this terrific blog. It's amazing how much "fruit" there is in cyberspace just waiting for us to pick it. Yours is delicious! Passionate - I don't normally read a lot of poetry but I think it's fun to focus on it for this month. Betty - It's wonderful to find books that are the right match for your kids! I really believe there's something for everyone out there. Bookshelf - Fantastic! Kids like poetry a lot more than adults think they will. April - Thanks for the link and the compliments!